A way to traverse between onsite and online. In August 2015 the site went live. 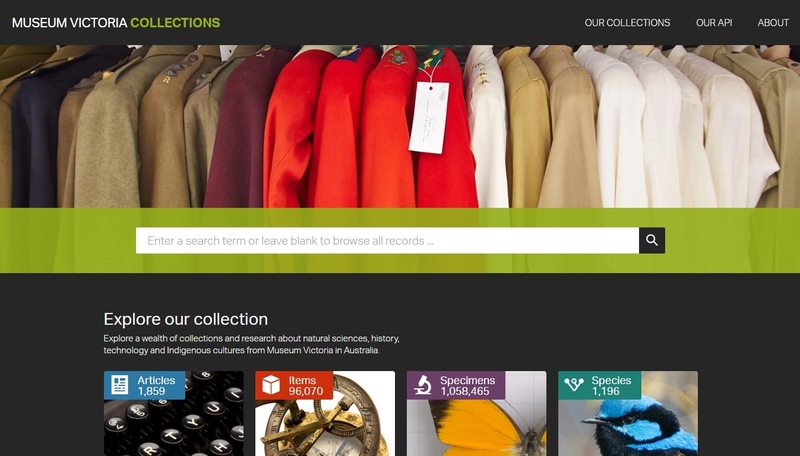 At March 2016 there are now over 96,000 pages with information about Humanities items; over 1,058,000 specimen occurrence records from Sciences; and over 3000 authored articles and species profiles that tell stories about people, places, events, the collections, and animals found in Australia. Pages are illustrated by a huge catalogue of images, including over 37,500 images marked as public domain and a further 84,500 available for reuse with a Creative Commons Attribution (CC-BY) license. The site achieves its original aims as well as providing a well-designed and usable interface. Building a collections online site that covers aircraft models to worms, and that is able to account for varying documentation schemas and rules is an achievement. The most significant points to note about the site, though, are to do with ‘open’. Museum Victoria values ‘open’! And we wanted the site to reflect that. The Museum undertook an extensive process, including writing new policy and a two year project to assess the copyright status of over 100,000 images. We achieved what we set out to do. Text information on every page is openly licensed – either with a CC-BY license for authored information or a CC-zero mark for data elements. Images are licensed individually. For images taken by museum staff and volunteers, we decided to apply a Creative Commons Attribution license, which provides tens of thousands of high quality images for easy reuse. 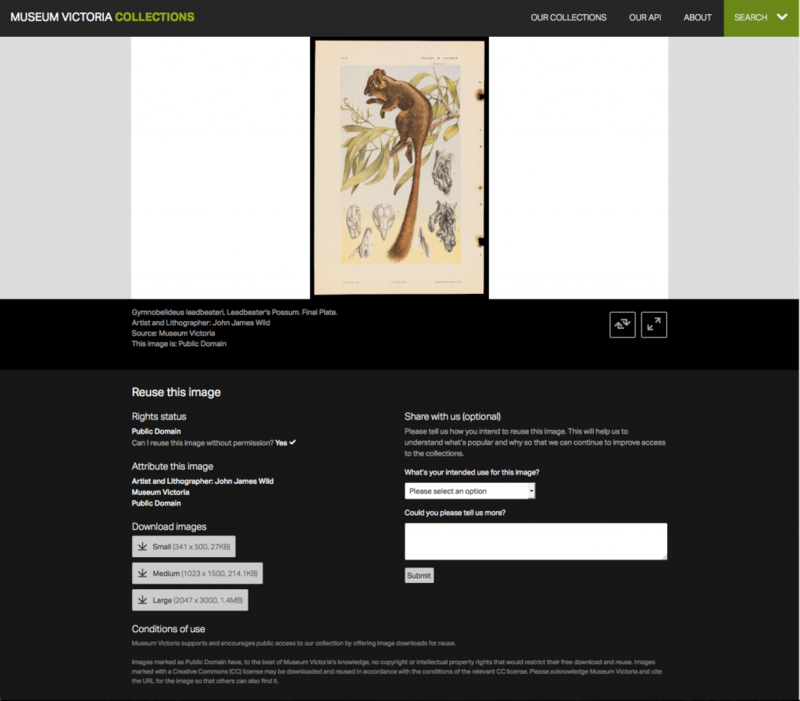 A facet for Image Licence is available on the search results page, so that users can filter to records with openly licensed images or public domain images. We want to encourage reuse of the content and the site provides assistance in several ways. Every content page shows how to cite the page. This was added particularly for researchers, educators and students. A reuse image panel allows users to either download images straight away or request to reuse them, if the image they want is either in copyright or hasn’t yet been assessed. We provide as big an image as we can and, where we have the files, offer a small, medium and large download size where ‘large’ is 3000 pixels on the longest edge. All content is drawn from our collection management system (Axiell’s EMu). Content additions, changes and updates can only be made in EMu and a nightly export ensures that the site is up to date. Content is exported into a publishing database built in Raven. The website frontend is custom-built using a .net Nancy FX framework. 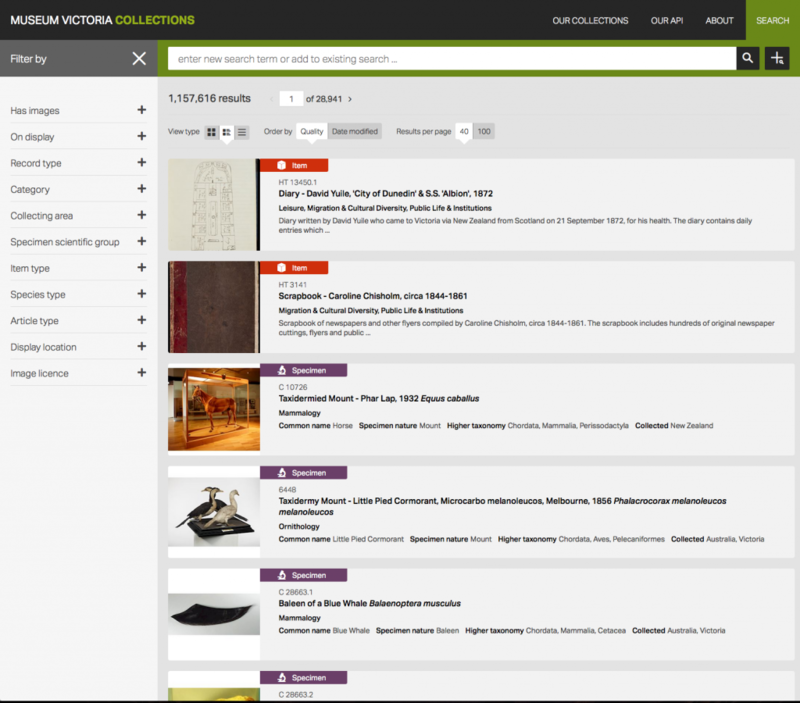 One museum’s collection has limits and other really interesting content is just a link away. 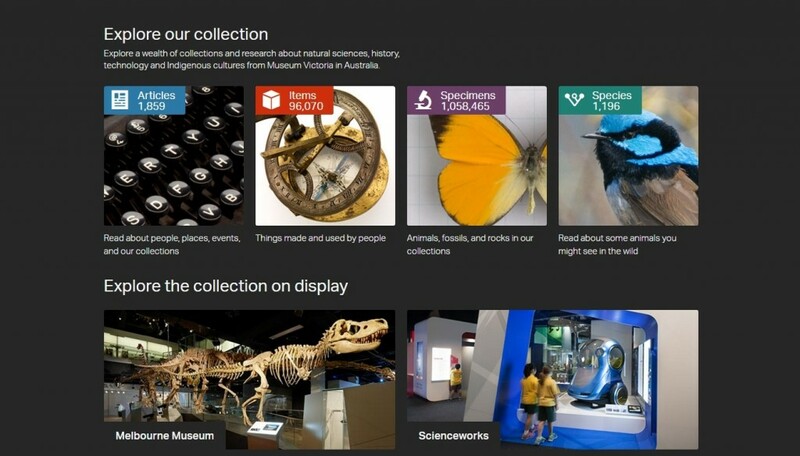 We currently provide links out to the Atlas of Living Australia for species pages, the Online Zoological Collections of Australian Museums for specimens, the Biodiversity Heritage Library, Thingiverse and the Google Cultural Institute. Creating the links is manual for most of these sites and making that process more efficient is a challenge for the future. Explore Museum Victoria’s collections by article, item, specimen or species. Content page in MV Collections showing media pane, image attribution, citation information and text attribution. Reuse image function in MV Collections. Search results page in MV Collections showing null query and facet options.